The short term up-trend in the QQQQ finished its 6th day on Friday. I like the fact that AAPL is holding up. We need to watch the leaders for signs of where the market is headed. I went through the new highs on Friday using the methodology I described last week. In doing so, I found a stock that appears top have broken out from a cup-with handle pattern. So, I am showing it below to provide my class with an example of this important bullish pattern, described by William O’Neil in his book (listed to the lower right). This bullish pattern is really a base formed after a large up-trend. The stock reaches a high, retraces some of its rise and forms a somewhat rounded cup. Then the stock rises back up but usually stops below the prior peak. Once it stops rising, it falls back a little on lower volume. Then it breaks through the price where it most recently stopped on higher volume than normal. KCI had a big down volume spike (red vertical line) in its handle which makes this formation a little suspect. But on Friday, KCI did break through the top of its handle (pivot price) on volume above its 50 day average of volume. According to O’Neil’s strategy, if one bought this break-out, one should cut a loss if its falls about 8% below the pivot price. For me, I would place a stop below Friday’s low price, where it also found support at its 30 day average. It will be interesting to observe whether KCI holds this break-out. KCI is far below its all-time high, so it is not the type of rocket that I typically purchase. 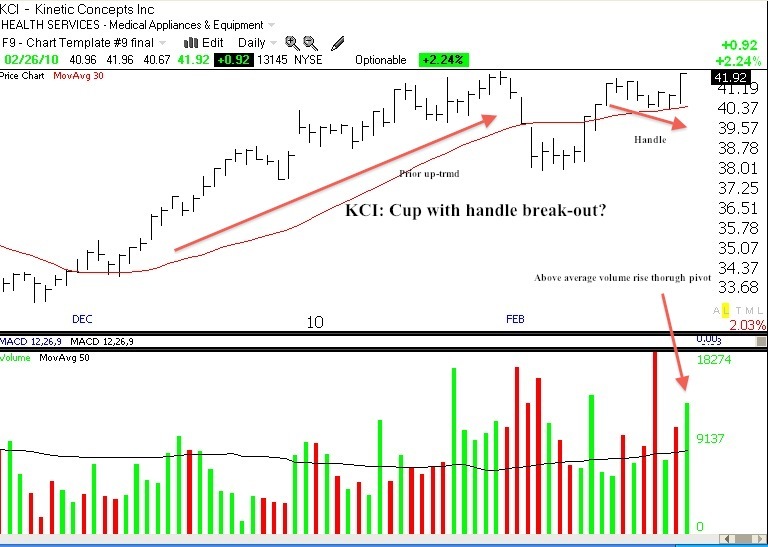 The best way to find cup-with-handle formations is to scan a lot of charts over the weekend….. The GMI remains at 6 and the GMI-R at 9. 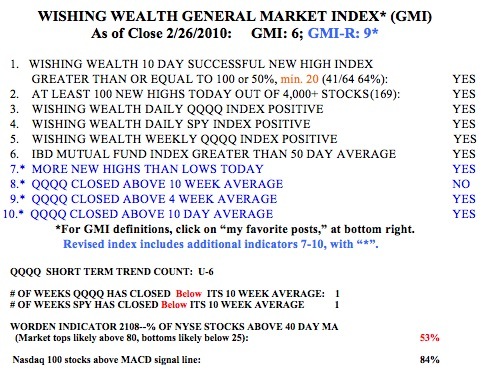 While my GMI indicators are strong, the trend of the QQQQ is erratic and not well defined. And the QQQQ and SPY are still below their 10 week averages. The Worden T2108 indicator is in neutral range, still at 53%. 84% of the Nasdaq 100 stocks closed with their MACD above its signal line, a sign that the stock is gaining strength. I am looking for stocks to buy but I am wading in very slowly. AAPL breaks out–T2108 near peak? Tech up-trend looks strong. I thought cup and handles are supposed to be at least 7 weeks long. Would PCLN be more of a cup and handle? The cup was about 8 weeks long and it declined around 16% from its peak. The handle was about a week long and it declined around 7% during that time period. Today PCLN looks like it’s crossing its pivot point of 235.80. Volume is not that great though… only around 1.4x, though we’ll have to see what happens in this last hour. KCI is killing it today! A tidy +14% on huge volume.